Howard County Executive Calvin Ball has named Lisa Myers to be the new chief of the county's police department. She will be the first woman and first black person to run the department. ELLICOTT CITY, Md — "The next great chief of the Howard County Police Department, Lisa Myers," announced Howard County Executive Calvin Ball, and with that a veteran of 27 years with the department, Lisa Myers, returns as the top cop after retiring as a captain a year ago. "I retired last year and received my first retirement check on February 1st and now start as chief on February 1st so it's been a wonderful opportunity," said Myers. An opportunity, which had eluded African-Americans and women as Myers' appointment breaks a glass ceiling on both fronts, making history. 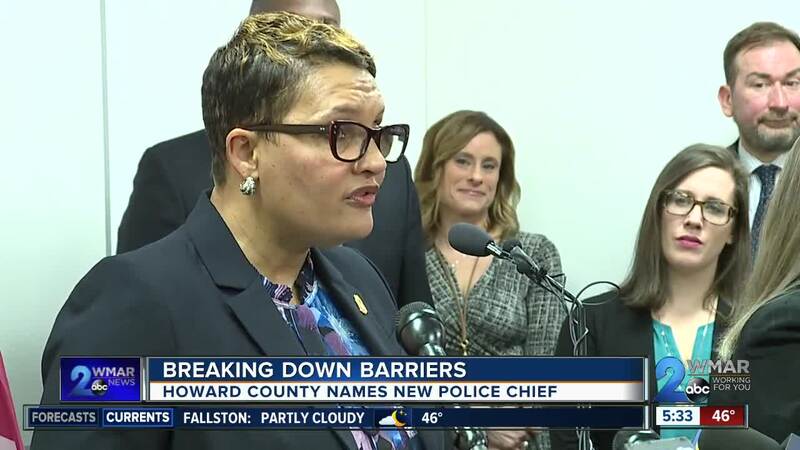 "I am grateful to Herman Charity---the first African-American officer hired in the Howard County Police Department in 1968 and to Leila Makowski---the first female officer hired in 1969,” said Myers, “They blazed the trails that make it possible for me to stand her today." Myers' mother, 81-year-old Joyce Bridgeforth, had a front row seat for the announcement. She grew up during the segregation years in East Baltimore and never envisioned her daughter rising to such heights in a profession she initially didn't approve of. "I didn't. I really didn't expect it,” said Bridgeforth, “When she first went into it, I didn't want her to do it. You know? I was scared for her, you know, but it's something she wanted to do, and I just went along with it." And now, the lessons learned from her mother and late father have made Lisa Myers the choice to lead the Howard County Police Department. "One of the things that she always taught me was about being inclusive and treating people with respect and being welcoming,” said Myers, “and I take that same view when I see us engaging the community---being welcoming and respectful and working together." Myer's selection is one of a number of "firsts" for Howard County this year after voters elected its first African-American county executive, sheriff and state's attorney, as well as Christine Uhlhorn being selected as its first female fire chief.